After our summer break, the Sogetsu group reconvened for a new year of activity, discovery, friendship and creativity at Shobhaa's home. 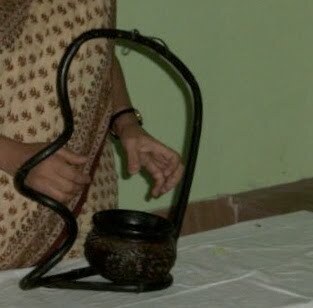 Our gracious hostess had made immaculate arrangements right from the garden tables for us to work on, flowers from Yercaud and a cosy little room for us to watch Padma aunty's demonstration. I think it was full house, with the exception of Venkatesh and Pushkala, and after the initial catching up with the summer news, we settled down to watch Padma sensei at work. 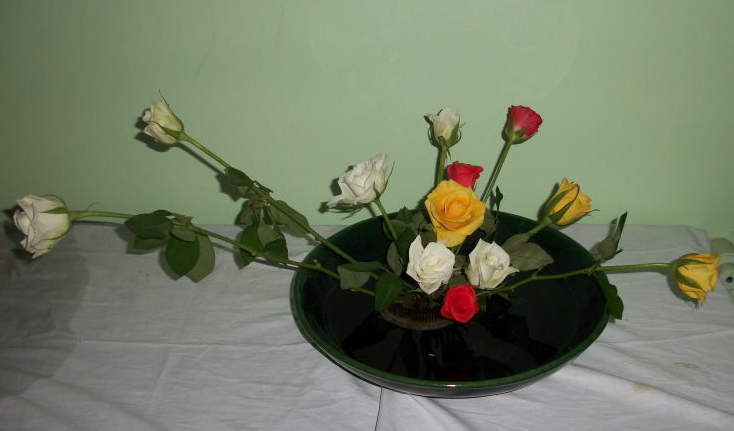 Her first piece was an all-round low arrangement with roses. 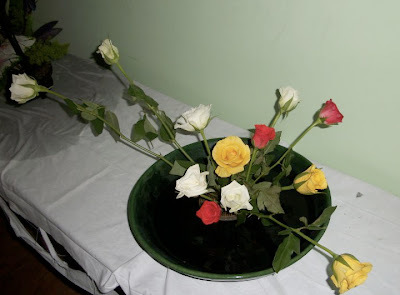 The ladies were delighted with the choice of material as we all tend to avoid roses because of their short life. But we should use them more, as nowadays the new hybrid varieties seem to have a longer life as cut material. Click on any of the photos to see the arrangements in greater detail. For her second composition, Padma aunty displayed this beautiful vase, with fossilised leaf engravings on either side. 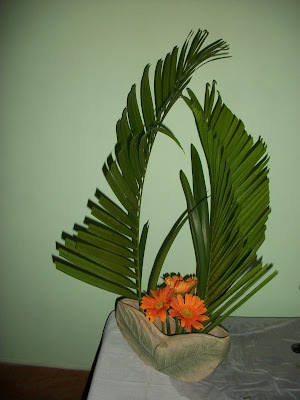 The design on the vase prompted her to use tall curving lines in the form of the palm leaves. The jerberas she added at the end provided a focal point, and completed the attractive composition. See below for the pleasing effect that was achieved! And the finale was this beautiful vase - all of us eye Padma aunty's vase collection and Meenu joked about how we should each pinch a few!! I forgot to note were this particular vase is from, and if I'm not mistaken it is wooden, and she used another bowl within for water. 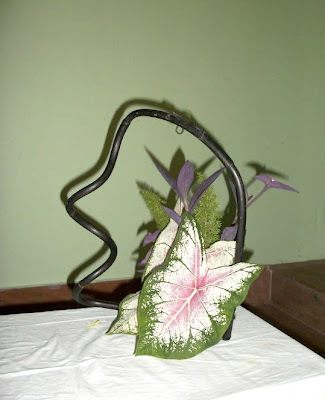 Shobhaa's eautiful and varied garden yielded these lovely caladium leaves you see below, and Padma aunty decided to use them instead of her original plan. This was my favourite arrangement of the morning! Once again there are two pictures, one with flash, where you see the ghost shadows at the back, but the caladiums look richer, and one without the flash. We then moved to the garden where those in the mood created their own little masterpieces. Shobhaa gave us a free rein of her garden, and I could not resist using the leaves of the shrub that all agreed was "kamini". Kamini is the common name for Murraya paniculata, and is an evergreen that grows to be a small tree or a large shrub! Seethalakshmi brought berries of a tree, which we could not identify. I wonder if it is Cordia myxa, aka lasura? 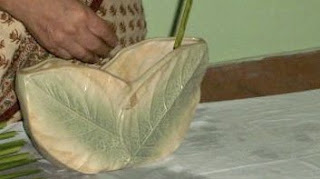 If I am not mistaken in Tamil it is referred to as "mukuchelli maram" because of its pulp which is like well snot!! I may be totally wrong!! After that, we went in to the house again, and gasped at the hearty repast that lay in front of us!! Venkatesh, you really missed a good "saapad", but Ashoka made up for you!! Thank you Shobhaa for being such a wonderful hostess, and thank you Padma aunty for an inspiring mini-demonstration. Next month we meet at ABK AOTS Dosakai.